Summary: This clock is simple to use, it comes with fun features such as the night light, and is, therefore, the best addition for your resting needs. The clock is highly interactive, and this makes it a good tool for kids. For most parents or guardians with little ones to take care of, achieving your goal of a good night’s sleep to wake up feeling refreshed is sometimes not an easy task. This is especially true if you child has to wake up early to go to school and you are often busy with your day-to-day schedule, which often leaves you deadbeat. You don’t want to necessarily set your personal alarm clock or wake up to inform your child to get up and prepare for the day. When it comes to becoming a good parent, there is nothing better that teaching your child the value of good habits, and especially waking up early to complete their day to day tasks. By choosing a good solution such as the OK to Wake! Alarm Clock & Night-Light, you can achieve your goals of training your child to become more independent and responsible with their sleep patterns. Experience the benefits of having an independent child by investing in the Ok to Wake! Alarm Clock that comes with various features to make it ideal for your needs. This clock has various lights and alarm sounds that can be customized to achieve the best sleep results. More so, these types of units are also available with special lights that indicate the current functionality of the alarm clock, such that your child never misses the message to get up. Simply put, this system is designed to help your child develop the appropriate sleep habits while letting you enjoy uninterrupted sleep. The manufacturers of this alarm clock have also done well to include the stable design, which ensures the clock can stay in one position without toppling over. Best of all, it has a durable plastic construction that guarantees optimal impact and scratch resistance. The main goal of this alarm clock, Is that it helps you achieve improved sleep quality and it also encourages your child to develop good sleeping habits. 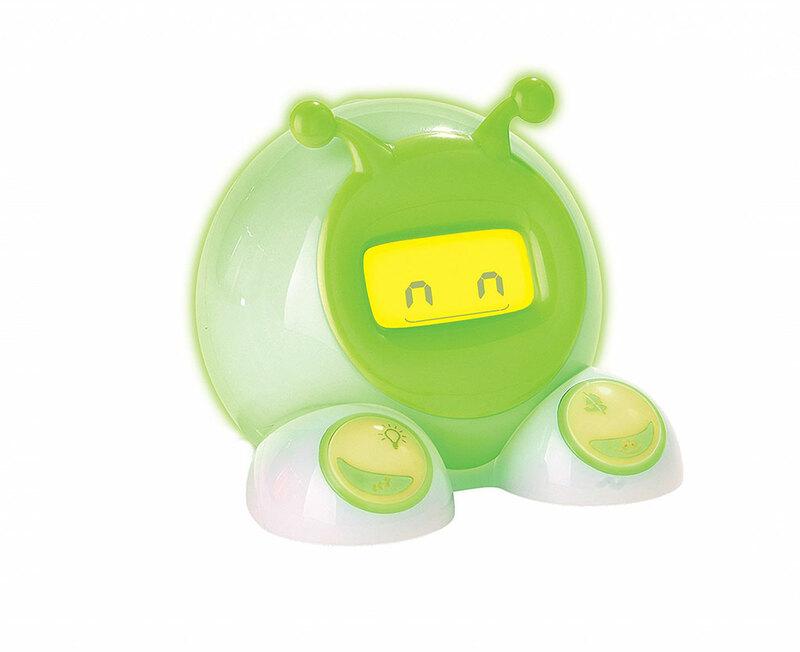 To be specific, it comprises of a soothing night light that helps your child to fall asleep. In the morning, the light glows green, and this indicates that it’s okay for your children to get up from bed. Having said that, if your child wakes up before the light comes on, then they can re-adjust appropriately by resuming sleep or perhaps resting in their room until the green light comes on. Since all children are open to achieving new goals and accomplishments, this clock helps them to achieve this goal and even more. Further lending to the excellent design of this clock is that it also comes with a convenient naptime and an alarm clock with snoozing capabilities as well. This bedside alarm clock also comes with exciting animations that give it a unique personality, to make it perfect for kids. With the inclusion of the nap timer and the dual night light that glows green, this clock informs children when it’s OK to get up and especially for families with young children. This feature does well helps guide your children to become more independent when it comes to sleep, which lets you sleep uninterrupted to waking up feeling refreshed. In particular, these lights have been programmed to light up at the specified times and its simple to set up a well. The appealing colours are perfect for encouraging your child to start their journey to becoming an independent individual in life. The inclusion of the soft yellow night light that glows green when it’s ok for your child to get out of bed makes it highly convenient. Besides that, another advantage of this Alarm clock is that it also has a convenient nap timer, snooze, fun animations interchangeable faceplates for added convenient. Best of all, this alarm clock can be powered using a USB cord, and it comes with a backup mechanism of 4 AA batteries as well. The robust battery guarantees several hours of unrivaled performance, whereby the clock guarantees optimal results even during power outages. More so, this dynamic form of power is convenient and lets you choose the most suitable approach for powering the clock to suit the needs of your child. This alarm clock allows you to enjoy convenient functionality with several design features. For instance, the design interface is basic, and it comprises of minimal features that are simple to navigate. More so, it also grows with families since it helps them improve their sleep quality and it encourages your children to become more independent. The child-friendly toe buttons are easy to reach and fun to interact with as the children discover the various lighting animations that are available with the clock. You don’t need any user manuals or advanced skills to set up the clock for your child. All the controls are well placed such that you can enjoy improved sleep as soon as you set up the clock in your child’s sleeping area. Taking all the important aspects into consideration, there is nothing better when you and your child can experience a good night’s sleep and without any interruptions. However, this is sometimes difficult, especially if your child is not yet accustomed to waking up on time. Using the conventional alarm clocks is often demotivating, and most children can’t have fun with such tools. Therefore, we are highly recommending that you consider fun solutions such as the OK to Wake! Alarm Clock & Night-Light review. This clock is simple to use, it comes with fun features such as the night light, and is, therefore, the best addition for your resting needs. The clock is highly interactive, and this makes it a good tool for kids.